Ordering Chinese food in Utah a few decades ago meant coming home with a few white cardboard boxes packed full of chop suey, fried rice and fortune cookies. What Utahns considered Chinese food back then was a far cry from what most Chinese cooks served their families at home. And even today, many still miss out on authentic Chinese cuisine by habitually ordering Americanized dishes of deep-fried foods drenched in sweet sauces. Once you make an attempt to bust through the wall of orange chicken and crab Rangoon to scratch the surface of authentic Chinese dishes, it’s easy to be captivated by the fascinating—and delicious—nuances of the cuisine. With a history that spans thousands of years and the influence of culinary dialects from diverse regions, Chinese food is dizzyingly complex. If such complexity causes your taste buds to dance, then here are some regional Chinese dishes you’ll want to check out. The cuisine of the Shanghai region is defined by the retention of the flavors of its ingredients. Boba World is no exception—the respect that they show their ingredients is on display with every dish. The true testament to this respect comes from the Shepherd’s Purse Shanghai Rice Cake ($8.95). 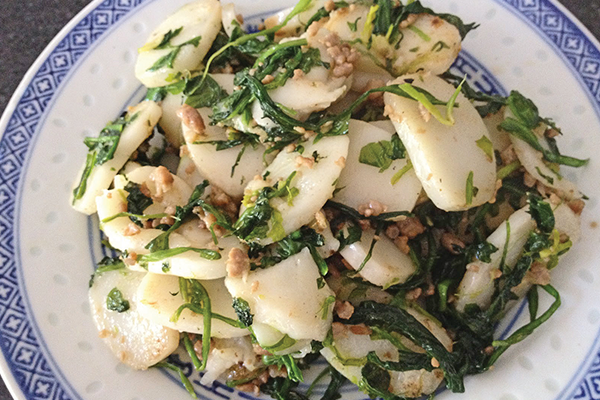 The rice cake arrives sliced into pleasantly chewy rounds and topped with chicken and greens. After my first bite, I swore that its golden sauce was thick with butter, but I soon realized that the intense flavor of the chicken was responsible for this richness. I’m still in awe. As it was born on a small island off the coast of China, the cuisine of Taiwan had its limitations. But, limitations are often the best path to creativity, which is where the traditional cuisine of Taiwan finds itself. The offerings available at Mom’s Kitchen exemplify getting the absolute most out of only a few ingredients to supercharge their existing flavors. 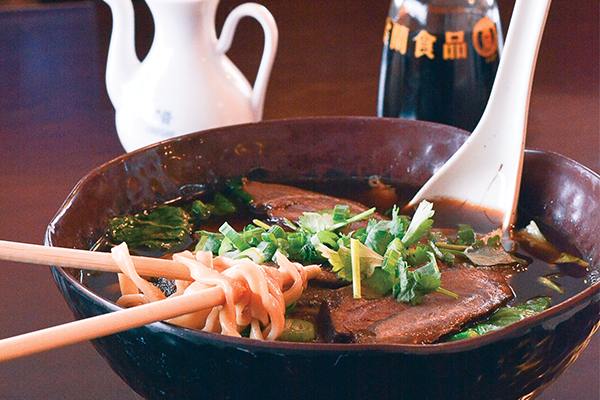 The best example comes from the beef stewed noodles ($9.99), a tangle of homemade Taiwanese noodles, thick and full-textured, stewed in a rich beef broth and topped with thin slices of brisket. Deep, comforting umami is the star of this dish. China’s Sichuan region is known for heat—and lots of it. Fans of spicy food will want to check out Szechuan Garden—one of Jon Huntsman Jr.’s favorite local joints—high praise coming from a former ambassador to China. The dishes here tease your mouth, letting you appreciate the smoky flavors, instead of overwhelming you with their capsaicin content. 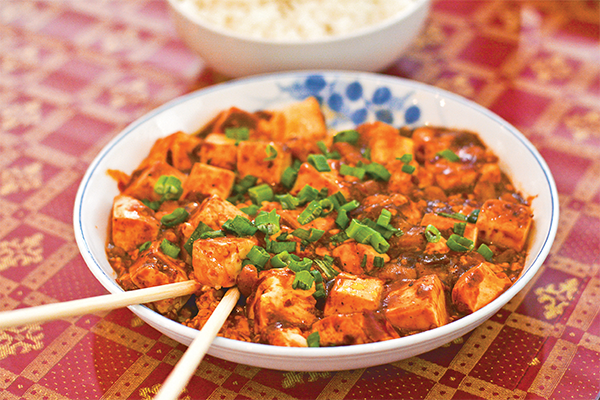 The minced meat with bean curd ($7.95) consists of small, silky tofu cubes topped with a pepper oil sauce. 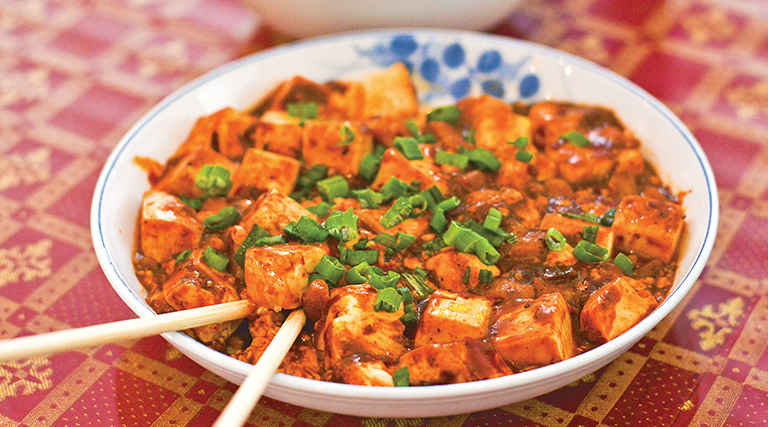 The creaminess of the tofu balances the heat of the sauce, letting that nuanced smoky flavor settle on the tongue. Many regional cuisines are defined not only by type of food and preparation techniques, but by the culinary experience itself. 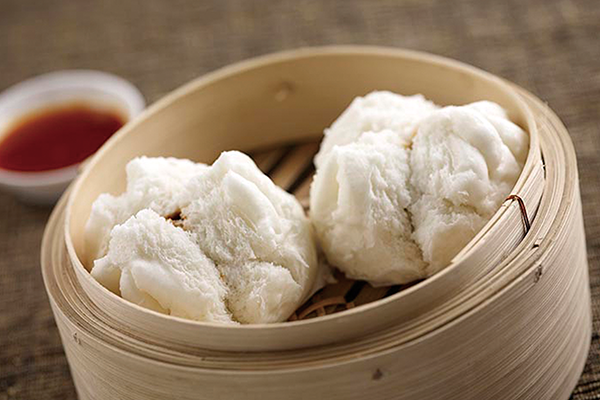 Dim sum, the breakfast/brunch meal developed by Chinese teahouses thousands of years ago, is one such experience, and it’s integral to Cantonese cuisine. Hong Kong Tea House offers dim sum every day before 3 p.m., and it doesn’t skimp on the selection. I heartily recommend the BBQ pork buns ($2.75)—steamed or baked, you can’t go wrong—and the steamed stuffed bean curd roll ($3.20), or, if you’re feeling dangerous, take a leap and try out the steamed chicken feet ($2.75).